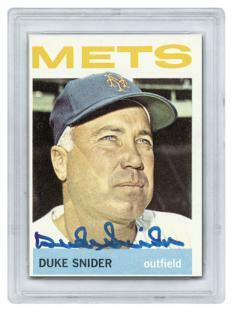 In just two weeks, Topps will offer one of its most unique releases to date. Over 150 retired ballplayers including the likes of Hank Aaron, Willie Mays, Yogi Berra, George Brett, Nolan Ryan, Cal Ripken Jr., Reggie Jackson, Frank Robinson, Mike Schmidt, Robin Yount, Duke Snider, Jim Palmer, Joe Morgan, Stan Musial and Paul Molitor have all teamed with Topps to make Topps Originals - Signature Edition one of the premiere baseball card products of 2004. Each pack of Topps Originals - Signature Edition will include one hand numbered Autographed Original Topps card enclosed in a tamper-evident case. Each card will also include the Topps 3M sticker to insure collectors of 100% authenticity (Topps is still the only company that witnesses every single autograph in person). Adding to the nostalgia, each player has autographed an assortment of his own original classic Topps cards. And the handfuls of different autographed cards featuring their own sequentially numbering also adds increased collectibility to the product. For example, Hank is signing a different amount of 1968 cards than the 1969 cards and the sequential numbering will reflect this difference. And it would not be Topps without the Rookie Cards! Each player has autographed one copy of his rookie card. Let the hunt for the Autographed 1954 Topps Hank Aaron (1 of 1) begin. Each pack of Topps Originals Baseball - Signature Edition carries a $50 SRP.